You are here: Home / News Letter / MUSIC FOR THE HOLIDAYS! AND AT A DISCOUNT, TOO! We at Music Publishers of America wish all our friends and customers a very Merry Christmas. We’d like to help you with your holiday gift-giving. So, here’s the deal. Spend $50 or more on any purchase from our website and get 25% off. We’ve got sheet music, charts and folios for concert band, small band and orchestra, accordion and piano. Plus CDs of music featuring Vitak-Elsnic selections as well as antique sheet music covers suitable for framing. Got to our online store at https://vitak-elsnic.com/shop/. 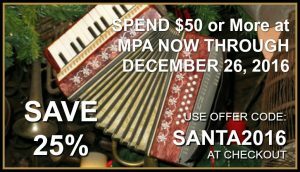 When you’re ready to check out (and you’ve spent at least $50), simply enter the discount code “santa2016”. Then get ready to make and enjoy some great music! Offer expires December 26, 2016.